At the end of May 2012 I was battling with depression, overweight, and I smoked around 15 cigs a day. All the usual life dramas – money, work, boys – were “getting me down”. I muddled through, as I have learned to do over the years. 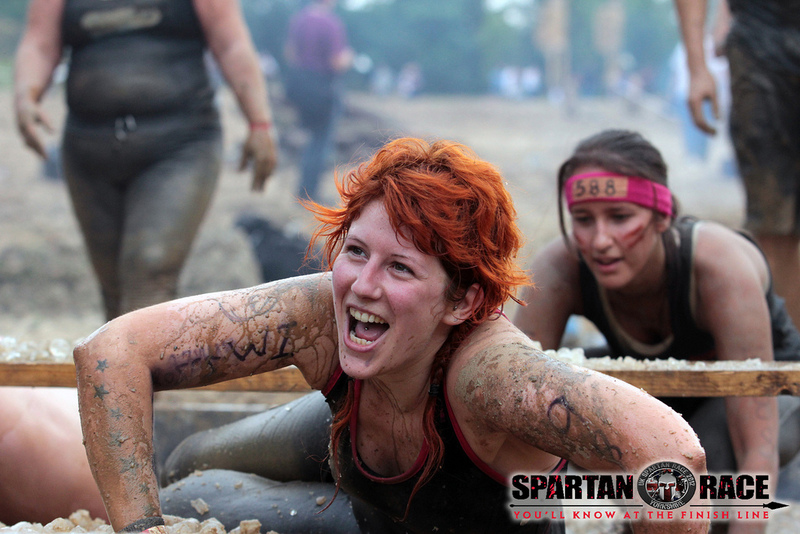 Two of my friends from WI told me about the Spartan Sprint in Ripon that August. With the promise of fun, mud and lots of half-naked people to hoist me over walls I signed up. And then I began to make plans. Knowing all too well I had no chance of running the whole way I got on the Couch to 5k programme. Those early sessions, jogging for 30 seconds then walking for 2 minutes, seemed endless. But I stuck at it and a few weeks later I could run a mile. A whole mile. Non-stop. It took me about 13 minutes, but I could do it. By the very end I was running for about 40 minutes. Non-stop. It was marvelous. This, plus a rather lame attempt at developing some muscles elsewhere in my body, did manage to get me through that first race. With the help of my friends and many other Spartans, I crossed the line, muddy, wet, cold, knackered and elated, in 1:45. I had already lost a bit of weight and discovered something that was fun and good for me, so I started to make plans for more running. Could I do a 10k road race before the year was out? I wasn’t sure, but I decided to give it a go. In the end I did three in those final few months of 2012 – Yorkshire Coast on October 28th (1:13:18), Leeds Abbey Dash on November 18th (1:09:53) and Leeds Christmas 10k on December 2nd (1:12:01). I also did the Chester Round the Walls race of approx. 3 miles on Boxing Day. 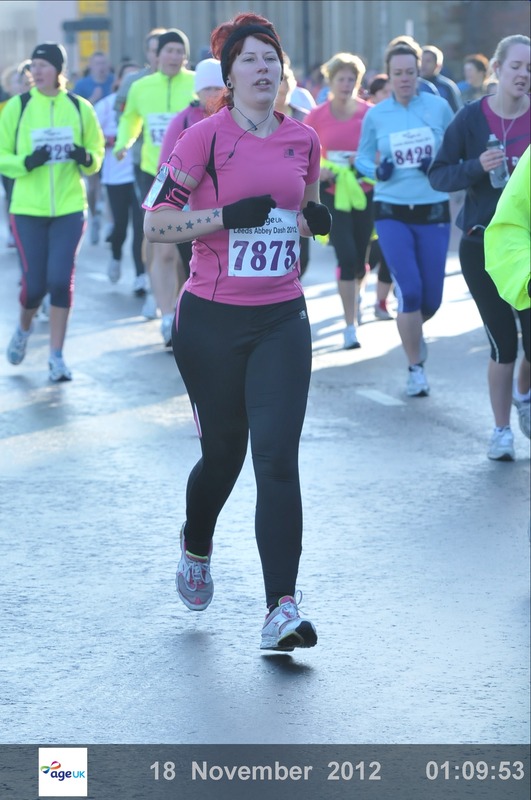 That was when I knew I really was a runner – foregoing a lie-in and fizzy breakfast to race in the freezing cold! 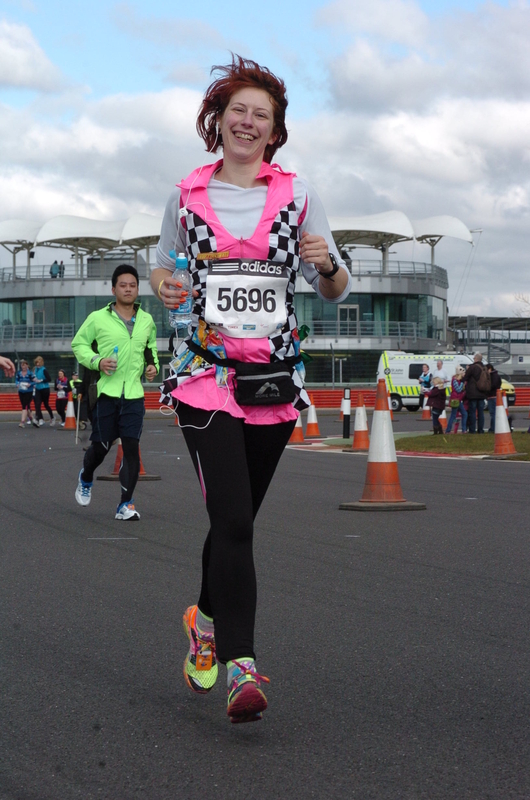 Towards the end of 2012 I found out about the Silverstone Half Marathon and, being a massive Formula 1 fan, knew this had to be my first 13.1mile race. I completed it in 2:21:59 – well under my sub-2:30 goal. I cried coming over the line – what a release! All those weeks of training, all those talks I had to have with myself, all those times I kept putting one foot in front of the other without really knowing if I could go on. I did it! I joined Kirkstall Harriers Running Club, which is great in so many ways. I love the camaraderie of training and racing with new friends, not to mention the social side that helps to get me out of the house. 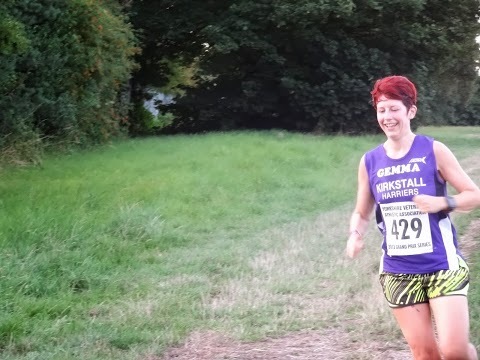 Being a member of a running club has opened up a whole world of other races and running opportunities and I have already completed dozens of races this year – everything from one-mile track races and trail relays to Leeds Half Marathon, a whole host of 10ks and some more mudstacle events. Next year’s calendar is already filling up nicely! Since the start of this year my running has improved massively, and so has my mental and physical wellbeing as a result. I have lost around 3.5st in total and am not only much happier with my body but amazed and grateful for what it can do. I am learning to accept myself and deal with difficult times in healthier ways. I have given up smoking (five months and counting) and have made a lot of new friends through running. My race times have fallen dramatically, and are still coming down. I train, race and run parkruns regularly and barely a month goes by when I don’t record a new PB. I know this steep improvement curve won’t last forever, but I am relishing it while it does. 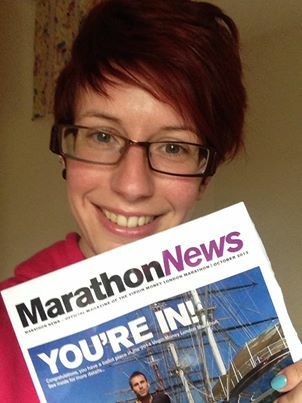 At the beginning of March 2013 I was still adamant I did not want to run a marathon. It had never been in my plans, even in those early days after catching the running bug. I just could not see myself running and running and running for four or five hours. Then I watched Boston and London Marathons on TV. And before I knew it my name was in the hat for London. I found out at the beginning of October that I got a place in the ballot and so now begins the really hard work. If I can make it to the start line I will consider that a win. If I can make it over the finish line I will be on top of the world.